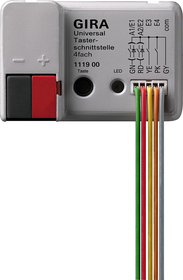 Flush-mounted binary inputs, can be used in deep device box (60 mm deep) behind a conventional switch/push button, for connection of zero-voltage contacts. The switching operations of zero-voltage contacts are converted into KNX telegrams. The inputs can be assigned various functions or blocked independently of each other in the process. The inputs can be parameterised as outputs (max. 2 mA). Blocker for blocking individual inputs. Behaviour upon bus voltage recovery can be configured separately for each input. Two independent switching objects are available for each input and can be released individually, command for leading and trailing edge can be set independently (ON, OFF, CHANGE, no reaction), cyclical transmission of the switching object depending on the edge or depending on the object value can be selected. Single-surface and double-surface operation, time between dimming and switching, and dim-step size can be set, telegram repetition, and stop telegram transmission possible. Command can be set with rising edge (no function, UP, DOWN, CHANGE), operating concept can be configured (Step - Move - Step or Move - Step), time between short and long-term operation can be set, slat adjustment time can be set. edge (button as NO contact, button as NC contact, switch) and value with edge can be configured, value adjustment with button by pressing and holding button for value transmitters possible, light scene auxiliary unit with memory function and saving of the scene without previously calling up is possible. edge and value configurable, value adjustment with push button is possible by pressing and holding button. edge for pulse counting and interval time for meter reading transfer can be configured, edge of the synchronisation signal for resetting the meter reading and switching telegram when synchronisation signal arrives can be set. edge for counting the signals at the input and maximum meter reading selectable, increment for the counter reading output and telegram when the maximum meter reading is reached can be parameterised. Behaviour in case of bus failure and return, switch-on/off delay or time switch function, output clocking (flashing of an LED). 4-gang flush-mounted binary input. The four inputs can be assigned various functions or blocked independently of each other in the process. Two of the four inputs can be parameterised as outputs (max. 2 mA). Free assignment of the functions switching, dimming, blind and value transmitter to inputs 1 through 4 or pulse counters and switch counters to inputs 1 and 2.